This version uses a new bankswitching type, so you will need to upgrade to Stella 3.5.5 to make it work. It doesn't work on the Harmony cart yet - but it will soon. I haven't included the source this time as it is a mess, but I will post the source to future releases. Can't wait!!!! 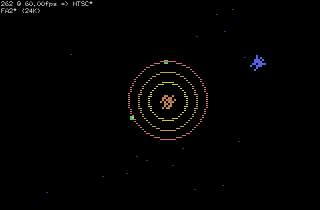 By far, Star Castle is my favorite arcade game from childhood (along with Tempest). Wow, this comes along very nicely. Wow! I don't even feel the need to turn on the phosphor effect! Impressive in so may ways! Superb attention to the details! I can't believe it's all there! Wish list suggestions: The "raspberry" phfft sound when you run into the rings. ...Do you plan to show the score like the arcade, between deaths and not clutter the gameplay? With all the suggestions you got, you can make 29 Games in this Game Program. I'm glad you fixed up the old ship and made it like this one. Score font is on my to-do list. Many thanks - it is all down to Nathan really! I hear that you are very good at TIA sound effects (I believe you did the sound effects for LadyBug?) I'm having a lot of difficulty getting anywhere close to the arcade effects for Star Castle, so if you have any spare time I could use some help? I'm having a lot of difficulty getting anywhere close to the arcade effects for Star Castle, so if you have any spare time I could use some help? I am using ftsfx-em.bin (Frame Timed Sound Effects-EM) from Eckhard Stolberg. A bit unusual to control, but good for creating simple effects. Sometimes when you've shot a hole in the inner ring, the energy cannon won't always shoot through the hole. Instead, it will shoot through a still-intact part of the inner ring. I don't yet do any checking to ensure that shots are only made through holes (it is a rather difficult calculation). Does the arcade version definitely do this? It appears that shots can pass through outer rings in the arcade, but I wasn't sure about the inner ring. Does the arcade version definitely do this? It appears that shots can pass through outer rings in the arcade, but I wasn't sure about the inner ring. I was just looking at this in MAME. It appear that when it fires the shot, it must have a clear path. A ring segment may then pass over the shot while it's en route, but it won't take a shot if there's a segment in the way. I'm thinking some kind of bit mask which tracks which segments are open in each ring along with a bit mask (with a single bit) representing the direction the cannon is facing. AND the masks together and all zero means no shot. The problem is you'd have to somehow rotate the masks to match the display, then update them as they are destroyed. Hrmm..
Just popped this into Stella. Wow. Just WOW. I really like the timing of all the shots, the color and rotation of the rings, the behavior of the chaser bombs. The speed of the chasers and the ship feel much better than what we have seen in the video of previous efforts by others. This one just "feels" right, esp as a 2600 game. I have not popped into MAME to compare the timing of the orig, but this version really feels good. I can barely wait until the next build. If this ever gets printed to a cart, I'm so ordering it.